Skull: The skull is a skeletal framework of the head of vertebrates, that supports the face and makes a protective cavity concerning the brain. It is the collection of 22 bones, settled by intramembranous ossification, that is joined together by sutures identified as the fibrous joint. These joints combine together in adulthood, therefore permitting brain growth throughout the adolescence. The skull is supported by the uppermost vertebra, known as the atlas, allowing nodding motion. The atlas shifts on the subsequent-lower vertebra, the axis, to permit for side-to-side motion. The skull bones can be classified into two groups: Cranium (which can be divided the skullcap is known as the calvarium, and cranial base) and facial bones. Enclosing the brain of the skull is known as the cranium. The cranium known as the neurocranium is made by the superior aspect of the skull. The cranium surrounds and protects the brain, meninges, and the cerebral vasculature. The cranium bones consist of eight bones. Anatomically, the cranium can be subdivided into a roof that is perceived as the calvarium, and a base. Calvarium bones comprised-of the frontal, occipital and two parietal bones. 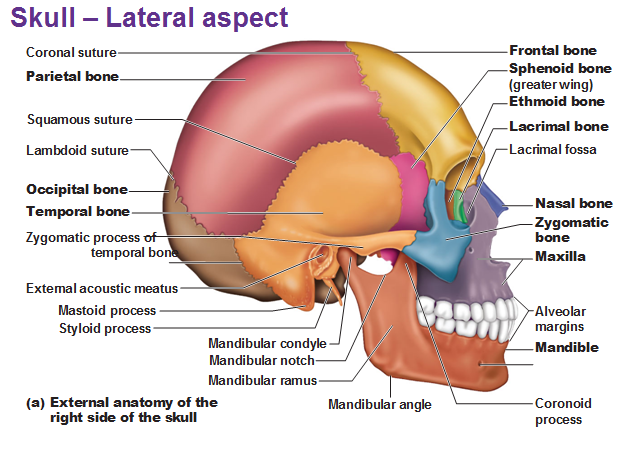 Cranial base comprised – the sphenoid, frontal, ethmoid, occipital, parietal and temporal bones. Collectively, the cranial bones provide a solid bony wall throughout the brain, with particularly a few openings for nerves and the blood vessels. The occipital bone holds the foramen magnum, the hole which the spinal cord penetrates the skull to connect to the brain. The occipital bone further forms the atlanto-occipital articulation with the atlas. The frontal, sphenoid and ethmoid bones hold small hollow areas identified as the paranasal sinuses. The sinuses help to decrease the weight of those bones and enhance the resonance of the voice throughout the speech, singing and humming. The facial skeleton supports the muscles and organs of the face are collectively known as our facial bones. The facial bones consist of 14 individual bones, that fuse to house the orbits of the eyes, oral and nasal cavities, as thoroughly as the sinuses. 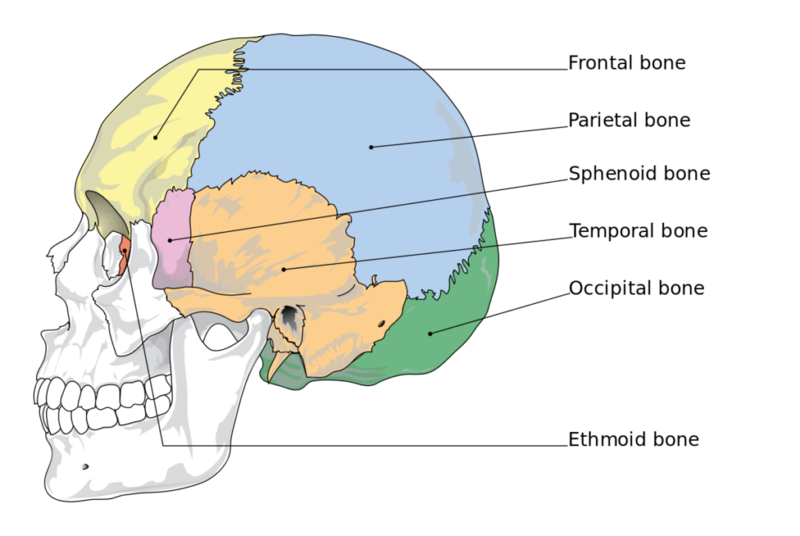 The frontal bone is sometimes carried as part of the facial skeleton. Maxilla (2) – Covers the upper jaw and hard palate. Zygomatic (2) – Makes the cheekbones of the face, and joins with the sphenoid, frontal, temporal and maxilla bones. Nasal (2) – Comprises two slender bones, found at the bridge of the nose. Inferior nasal conchae (2) – Positioned within the nasal cavity, these bones enlarge the surface space of the nasal cavity, thus expanding the amount of inspired air that can come into contact with the cavity walls. Lacrimal (2) – The tiniest bones of the face. The lacrimal make part of the medial wall of the orbit. Palatine (2) – Located at the back of the oral cavity, and makes part of the hard palate. Mandible (jaw bone) – Connects with the base of the cranium at the temporomandibular joint (TMJ). Vomer – Makes the posterior slant of the nasal septum. The mandible is the only movable bone of the skull, creating the temporomandibular joint. The lower teeth are rooted within the mandible where the upper teeth are rooted in the two maxillae. The maxillae further comprise paranasal sinuses similar the frontal, ethmoid, and sphenoid bones. Sutures are of fibrous joint that is individual to the skull. They are fixed and fuse entirely throughout the age of 20. The coronal suture that fuses the frontal bone with the two parietal bones. The lambdoid suture that fuses the occipital bone to the two parietal bones. The sagittal suture that fuses both parietal bones to each other. In neonates, the imperfectly fused suture segments give rise to membranous gaps within the bones, identified as fontanelles. The two major fontanelles are the occipital fontanelle (positioned at the intersection of the sagittal and lambdoid sutures) and the frontal fontanelle (position at the intersection of the coronal and sagittal sutures). Craniosynostosis is a medical condition in which one or more of the fibrous sutures in an infant skull prematurely fuses, and turns the growth pattern of the skull. 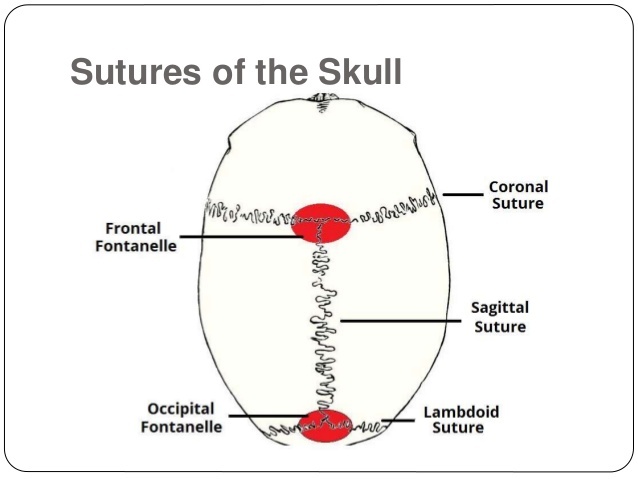 The skull cannot develop perpendicular to the fused suture, it develops more in the parallel direction. Sometimes the resulting extension pattern renders the necessary space for the developing brain but appears in an abnormal head shape and irregular facial features. The settlement does not adequately provide enough space for the developing brain, craniosynostosis occurs in increased intracranial pressure commencing possibly to visual impairment, eating difficulties, sleeping impairment or an impairment of mental development. A copper beaten skull is happening wherein excessive intracranial pressure deforms the internal surface of the skull. The name arises from the fact that the inner skull has the impression of having been beaten with a ball-peen hammer. The beaten skull condition is most common in children.